Lucky in life, lucky in New Orleans. Lucky in love, lucky in New Orleans. Lucky at cards, lucky in New Orleans. Lucky duck, lucky in New Orleans. Lucky in the looks department, lucky in New Orleans. Lucky at darts, lucky in New Orleans. Lucky at Monopoly, lucky in New Orleans. New Orleans has a monopoly on good luck, the best kind. Lucky in trouble, lucky in New Orleans. Lucky in the rain, lucky in New Orleans. Lucky at suppertime, lucky in New Orleans. Lucky in summer, lucky in New Orleans. Lucky on New Year’s Day, lucky in New Orleans, lucky as the year is long. Lucky as Dickie Dillon, lucky in New Orleans. Lucky as Charles Lindberg, lucky in New Orleans. Lucky as Charlie Luciano, lucky in New Orleans. Welcome to the New Orleans state of mind. Life is good in New Orleans. Lucky in a lightning strike, lucky in New Orleans. Lucky in an oyster bed, lucky in New Orleans. Lucky in a queen bed, lucky in New Orleans. Lucky at fishing, lucky in New Orleans. Lucky when wishing, lucky in New Orleans. Lucky in the stock market, lucky in New Orleans. Lucky in the meat market, lucky in New Orleans. Lucky in the supermarket, lucky in New Orleans. Lucky stars, lucky in New Orleans. Lucky charms, lucky in New Orleans. Lucky rabbit’s foot, luckier than the rabbit. Lucky dog, lucky in New Orleans. Dat Dog? Lucky in New Orleans. Lucky in real estate, lucky in New Orleans. Lucky when the going gets rough, lucky in New Orleans. Lucky when the tough get going, lucky in New Orleans. Lucky when the bottom falls out, lucky in New Orleans. Lucky when the levees break, lucky in New Orleans. Lucky to remember good things and lucky to learn from hard times, lucky in New Orleans. Lucky with your mother-in-law, lucky in New Orleans. Lucky mojo bag, lucky in New Orleans. Lucky at the race track, lucky in New Orleans. Lucky when relaxed, lucky in New Orleans. Lucky on your career track, lucky in New Orleans. Lucky to be alive, lucky in New Orleans. Lucky turducken, lucky in New Orleans. Lucky in politics, lucky in New Orleans. Lucky at living life to its fullest, lucky in New Orleans. Staying at La Belle Esplanade, lucky in New Orleans. Lucky, lucky, lucky, lucky, lucky; lucky in New Orleans. It is very nice to be lucky in New Orleans. It is all well and good to be lucky in New Orleans. New Orleans will treat you right. Get lucky in New Orleans. —Have a great New Orleans day, wherever you may find yourself! Sunday, June 17, 2018:. I live in New Orleans. I feel like the luckiest person alive. Ask any other New Orleanian. They will tell you the same thing. Get lucky in New Orleans. Visit like you live here. Stay at La Belle Esplanade. We only have five suites, so reserve early. Catch New Orleans’ spirit on Esplanade Avenue. Today’s header photo was taken last night at Restaurant R’evolution in the French Quarter. Frau Schmitt and I don’t go the Quarter often except in summer when it isn’t crowded. That was one excellent meal we had at R’evolution last night. 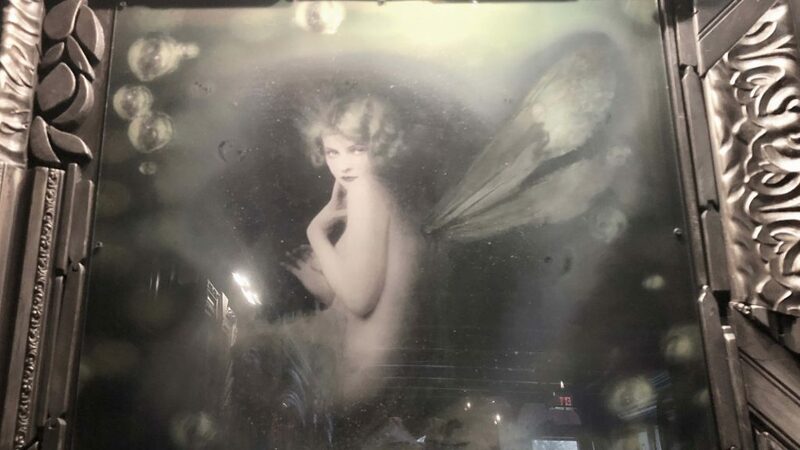 Photo of the Green Fairy at Restaurant R’evolution. Welcome to the New Orleans state of mind.